Over the past year, I have made the conscious decision to diverge from traditional large-scale painting in an effort to delve deeper into the concepts that have monopolized my work and ponderings for the past few years. 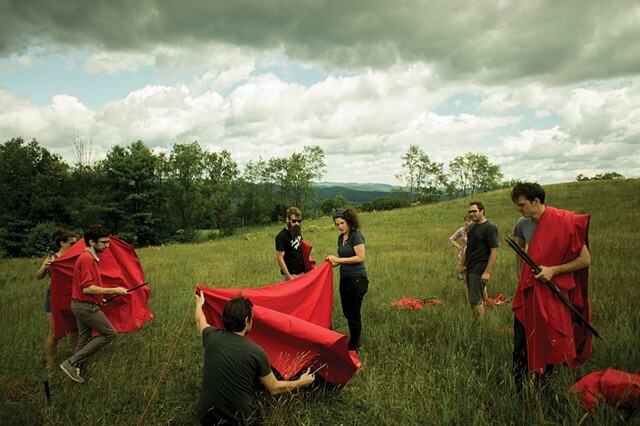 In designing, constructing, installing and photographing 35 red canvas tents, this project intends to explore and parallel human impact on the natural world. Informed by both temporary, nomadic dwellings and even the lasting footprint of the once grand and disintegrating structures, these works seek to address society’s relation to nature as it evolves throughout time- based on situational human need, purpose and control. Used recreationally to escape the modern world, as mobile military dwellings and as refuge from those suffering throughout political or natural disasters, tents are imposed continuously into our landscape- a momentary interjection of human experience. Human society and development has dramatically altered the face of our landscape. However, is our impact on the landscape as permanent as our own perception? Has society’s impact been primarily additive or subtractive? This exhibition includes photographs from a day-long instillation in the foothills of Corinth Vermont, south of The Green Mountains. The lush, almost untouched look of the fauna and rolling mountains was the perfect contrast for the imposition of 35 red canvas tents.